Ready-made Stock, a familiar and user-friendly generalized term that fulfills out the customer’s requirement on an instant basis. Paras Printpack ( Greater Noida) has incorporated the concept of ready made stock pouches where the user can scroll through a myriad of options and can opt for his required pouch format. With an assortment of sizes,designs & colors, zipper/without zipper, this idea serves a greater purpose for entrepreneurs & niche markets where a high degree of risk is involved in business initiation process without compromising the quality standards.Brand recognition plays a vital role in this highly competitive world. Just playing it safely, can help you to get your idea executed properly. Both sides Transparent Pouch: For Food & Beverages Industry, Automobiles & Electronics industry, Pharmaceutical items, Home Care, Personal Care etc. One Side Coated/ Both Sides Coated Pouch: For servings of Snacks, Namkeen, Confectionery items etc. where the aesthetic appeal is equally important as maintaining the barrier properties. 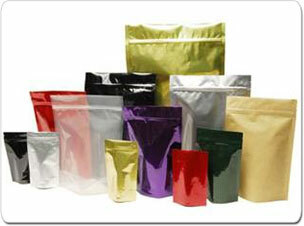 Foil Pouch: Products like relishes, purees, Jams , spreads, pharmaceutical industry etc. can have their extended shelf life with Foil Pouches. Kraft Paper Pouch: Eco – friendly move vis-a-vis other companies for packaging items that require a different display of products. Spout pouch: Inbuilt characteristic with pouch that eases out the problems regarding the dispensing of the product.